VOL. I NO. 46 REG. NO. 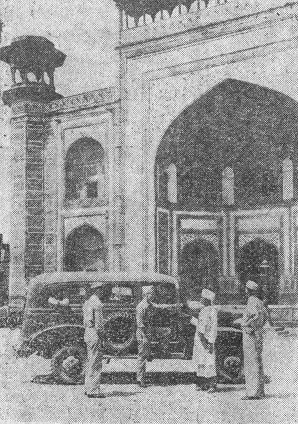 L5015 DELHI, THURSDAY JULY 29, 1943. 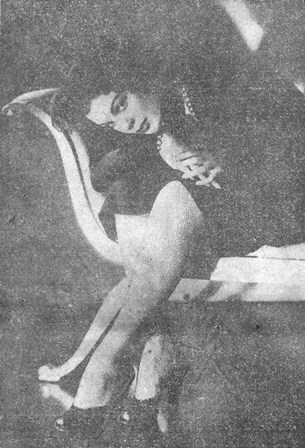 GLAMOROUS GAMS The dodge for publishing this week's cheesecake is contained in the caption sent along with the picture by Acme Photo: "There's no lack of glamour just because these stockings are made of cotton. Sheer and lacy black, they're perfect for your summer black cocktail dresses. (Army Nurse Corps in the C.B.I., please note.) Warners starlet Lynne Baggett models them." FIRST D.F.C. Lt. Ira M. Sussky receives from Gen. Bissell the first Distinguished Flying Cross conferred on a member of the 10th Air Force. 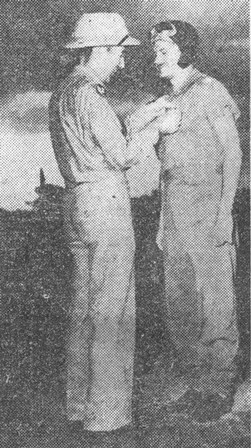 The award was for his daring rescue of Lt. Melvin Kimball of the 14th Air Force after the latter was forced down in sight of enemy positions in Burma. In two running air battles with the Jap, the 14th Air Force accounted for 30 planes confirmed and 36 probables with the loss of one P-40 and a Chinese pilot. Coming over in four waves more than 100 enemy fighters and bombers went after two of the 14th advance bases but were intercepted by badly outnumbered P-40's. Some of the bombers jettisoned their bombs before reaching the target and the others were so harrased that their aim would have smelled up Macy's front window. Minor damage only was sustained by ground installations while the P-40's accounted for 10 Zeros, six bombers and probably destroyed 12 Zeros and seven bombers. In addition six Zeros and three bombers are known to have been damaged. Not satisfied with letting the enemy lick his wounds for a while, the 14th this week sent B-25's and P-40's after the Jap aerodrome at Hankow. The American force of five mediums and 12 fighters was intercepted by a formation of 30-50 Zeros and, during a running battle of 150 miles, bomber gunners got nine confirmed and 13 probables. Fighters got five confirmed and four probables. One U.S. fighter plane and a Chinese pilot attached to the 14th is missing and there were no American casualties although the bombers sustained some damage. Fighting over Hankow was a little too rough to assess damage to the field at that time but later photographs indicated plenty of damage had been done. T/Sgt. Charles H. Patton, gunner, knocked down a whopping total of three confirmed and three probables during the fight while another gunner, S/Sgt. Marino R. Galluzo, got two confirmed. The only recreation for the Nip in Northern Burma recently has been watching the presentation of a "Monsoon Murder" drama conducted by pilots of the 10th Air Force. Striking in every direction with fighters, heavies and mediums, American pilots in India during the past week have left the greatest trail of wreckage since the start of the monsoon. One bomber was lost in a storm and one Jap interception was foiled by clouds. Fighters were out in force on July 20. The railroad bridge at Namti was made unserviceable by hits on the rails at its approaches. Jap headquarters at Sumprabum was bombed, flattening two large buildings and leaving a third in flames. A truck convoy leaving the town was strafed and an oil truck was seen to explode. A mill at Moguang operated by the Japs was damaged and supply dumps at Manahkang, Laza and Sedan were strafed and left burning. Both heavy and mediums attacked Myitinge bridge, dispersing the repair crews in panic. The heavies reported their bombs straddled the structure. Medium crews claimed three hits on the center spans. The medium crews also claimed hits on the Mu River bridge. On July 21 the heavies plastered the Namti mines which the Jap is trying to restore to service in his desperate need for lead, zinc and silver. The crews reported direct hits on the gravity separation plant and damage to the mine railway system, the water supply and coolie quarters. Another heavy formation bombed Wuntho. Five hits were seen before the clouds closed in. Mediums struck at river shipping near Katha. Near hits were seen on three large boats, one of which was set on fire. Damage was reported to additional river craft. The P-40's had an off day. They dropped bombs at Sumprabum and on Nsopzup highway bridge, but reported only slight damage at the first target and misses on the bridge. On July 22, fighters more than made up for their off day. The highway bridge at Nsopzup was demolished with three direct hits. A new barracks area was discovered near Myitkyina airfield and bombed. At least two barracks were left in flames. A motor convoy was surprised and strafed near Manywet. Three trucks were destroyed. Mediums attacking the cotton mills at Myingyan reported many direct hits and a large fire started north of the target. Other mediums hit the railroad yards at Alon but clouds prevented assessment of damage. A third bomber formation plastered the storage facilities at Meiktila, leaving many fires behind. The crews of this flight reported that the barracks area at Meiktila has completely vanished due to previous bombings. On July 23 the mediums went out for river shipping in the Irrawaddy and the dock area at Mandalay. Near hits causing serious damage were reported on five big river boats and dock storage sheds were fired. Another medium formation smacked Myingyan. Among installations reported destroyed was an ammunition dump. Heavies deposited 13 tons of bombs on installations at Kawlin but the weather prevented seeing exactly what resulted. The fighters rusted in the monsoon. July 24 was the busiest day of the week. Sumprabum was the morning target for fighters. Three large buildings were destroyed by direct hits. Four fires were left burning among supply dumps, one of them large. Troop headquarters were strafed and showered with fragmentation bombs. Many fires were seen. Afternoon festivities included destruction of the vehicular bridge at Hpunginzup and strafing of repair crews at Nsopzup. The loss of these two bridges seriously delays military traffic between the Jap forward base at Sumprabum and the headquarters at Myitkyina. Armed with 1,000-pound bombs the fighters then smacked the railroad bridges at Namti. Direct hits displaced the central span and destroyed rails at the south end of the bridge. The Jap, weary of repairing railroad bridges, is making no attempt to patch up the wrecked railroad bridge at Loilaw, which has previously been knocked out three times. Heavy bombers dropped 15 tons of high explosives on Monywa. Many hits were reported on tracks and rolling stock and two huge oil fires sent smoke billowing to 6,000 feet. 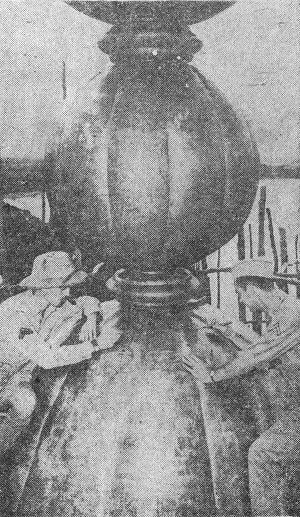 Other heavies bombed the jetties at Akyab, the Pagoda Point landing grounds southwest of Rangoon, and two 100 foot boats beached opposite Goyangyi island. The stern of one boat was blasted off. Medium bombers were equally busy. They caught a small ocean steamer approaching Akyab and bombed it and strafed the crew. A near hit damaged the stern. Other mediums reported four successful attacks. Rolling stock and tracks were destroyed at Kyaikthin. Warehouses there were also demolished and a large fire left burning. At Kawlin direct hits were made on freight cars and rail sidings. At Zawchaung, a large warehouse was laid flat. In the Chindwin River near Kan a river boat was bombed and left in a sinking condition. Fighters were again active on July 25. Mogaung was attacked in force with all bombs in the target area. A large building was destroyed attended by a violent explosion and black smoke. The Jap headquarters was plastered with frags, and fires were left burning. The bridge at Tiangzup was tilted up on one side and unusable after near misses with 500-pound bombs. 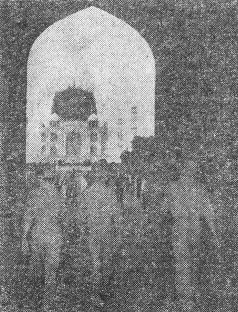 At Sumta a large bungalow, believed to be enemy officers' quarters, was destroyed. Heavies bombed a new barracks area north of Katha but estimates of damage were low. No reports of operations for July 26 have been received, but it still all adds up to the best week's operations yet for the monsoon season. It may eventually prove to be nothing more than the old malarkey, but optimistically-inclined G.I. 's in the C.B.I. Theater can start sharpening up Spam-softened teeth between now and Thanksgiving according to sweet music recently wafted to the Roundup's sensitive ears from the War Food Administration in Washington. According to the dope, a concerted search for 10,000,000 pounds of turkey meat is to begin in the U.S. for shipment overseas for Thanksgiving, Christmas and New Year's service menus. To show what the folks back home think of youse guys, this will be approximately one-third of the entire yearly domestic supply of gobblers, and G.I. 's in the States will come in for part of the remaining two-thirds, leaving some civilians what the little boy shot at. In order to avoid another case of "too little and too late," turkey will be as scarce as turkey-hen's teeth on civilian tables in August and September, not that much is eaten in those months, anyway. Virtually all the turkey that can be produced in this period will be snapped up by the Army for overseas shipments, and let's hope nothing happens to the ships. Of course, it's a long way from home to the C.B.I. Theater, and what we're talking about doesn't grow in cans. But Hell - a guy can dream, can't he? has been suppressed by Washington authorities. I have had many flattering offers from American newspaper syndicates to write just such a column for domestic consumption but I had turned them all down because it seemed to me a patriotic privilege and great honor to write exclusively and without any remuneration for our men overseas. 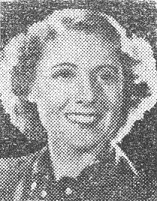 "I felt I had been completely fair and unbiased in my presentation of the Washington scene but it is now clear that I must have been in the hair of those who are not anxious to have our men overseas know how many people feel about the home front. "To all loyal readers of the Roundup; to your able and courageous editors; to the men of Stilwell; hail and farewell. My pen is no longer at your service in CBI but it is and always will be here at home." The Clare Boothe Luce column has reached a premature end, with the War Department serving as chief executioner. "Attention is invited to the fact that the printing of a column which may introduce political questions of a controversial nature in an official publication is contrary to the policy of the War Department. Inasmuch as the personnel charged with publishing the Roundup are under your jurisdiction, it is your responsibility that all political material be eliminated from this column so long as it is carried by the CBI Roundup." To eliminate "political questions" from the Luce column would be to emasculate it to such an extent that it would no longer contain either meat or interest, hence it has been killed outright. In a third paragraph the War Department called attention to the fact that two officers from the Special Services Division are in the Theater and "are available to furnish you any desired assistance in . . . the operation of camp newspapers such as the Roundup." We're still chuckling about that one. In her column, which we were forced to kill this week, the Congresswoman answered a letter from a G.I. in this Theater asking if he would be able to get his job as an airplane welder back from women workers. It is with regret that we kill Clare Boothe's column. The blond playwright, former women's magazine editor and wife of the publisher of Time, Life, & Fortune, Henry Luce, wrote the column exclusively for the Roundup. The editors of the paper had discussed such a contribution with her in Burma when this paper was a vague dream. One day a letter arrived in which the Congresswoman offered to do a column every two weeks. We jumped at the chance and she surprised us by cabling each week. Her literary efforts were gratis - all we paid was the cable toll. We know that Clare has been deluged with offers to do syndicated columns and columns for prominent newspapers and magazines. Therefore it was with considerable pride that we printed her lively, controversial, salty pieces in the Roundup. As a gag we "nominated" her for Vice-President last week. That, incidentally, had nothing to do with the "kill" order. We consider her one of the most colorful and newsworthy persons on the American scene. She had a great many personal friends in this Theater and took a keen interest in our future. We will miss her. Five G.I. 's arriving at the main gateway, are picked off by an ubiquitos guide. 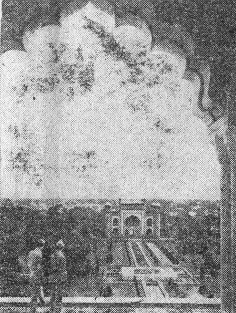 Through the main gate, the Taj is framed in the distance. 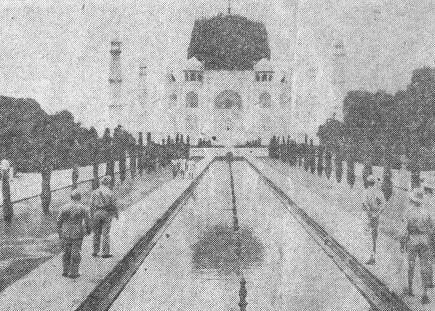 The best-known view of the Taj - along the mirror pool. The famous dome is now temporarily defaced by wartime scaffolding. Descending the marble stairs to the "holy of holies," the mausoleum. 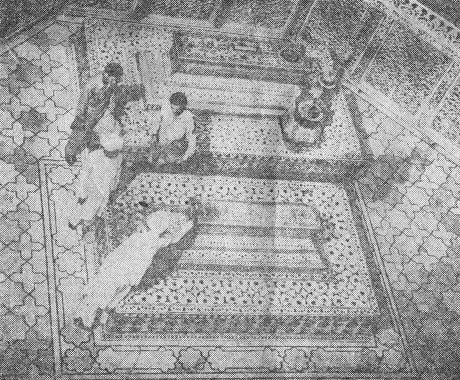 The Taj is "holy ground," so felt slippers must cover G.I. shoes before entering. A temple priest points out the beauties of the intricately-carved tombs. Looking up at three G.I. 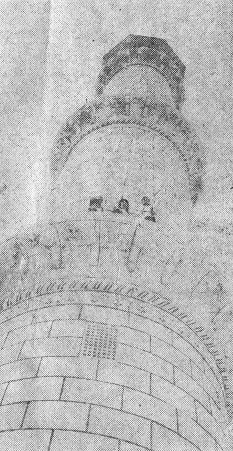 's on balcony of one of the minarets. Could be New York - from the angle of the heads of the visiting firemen. Looking back at the gateway, along the mirror pool, from the Taj. An old American custom. Two G.I. 's carve initials on the pinnacle, 260 feet up. CHINA - One would expect this in the bureaucratic maze of Washington red tape, but hardly in our own C.B.I. Theater. In mid-March, Pfc. 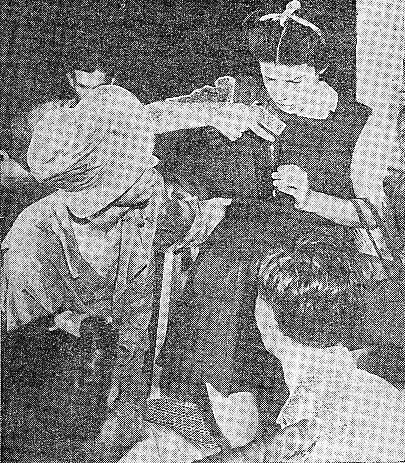 Lloyd E. Kinsman was a patient at a British hospital in India. There he had the misfortune to break a drinking mug. Military channels being what they are, the commanding officer of the company where Kinsman was serving in mid-July received a communication, to wit: A bill from the British hospital stores department for the price of one drinking mug, plus the indorsement of the C.B.I. Theater headquarters, plus the indorsement of the base section headquarters, plus the indorsement of the regiment and a covering letter directing that the soldier concerned buy an Indian Post Office money order in the amount of the cost of the mug. The communication then returned via company, regiment, base section, theater headquarters to the British - who no doubt were grateful to have their records balanced by receipt of the substantial sum required - five annas or about one thin American dime. INDIA AIR BASE - Mr. Jap will have to think up another silly excuse for treating our captured airmen in an unmilitary and inhuman manner now that the last of the Tokyo raiders have left this Theater for the States. 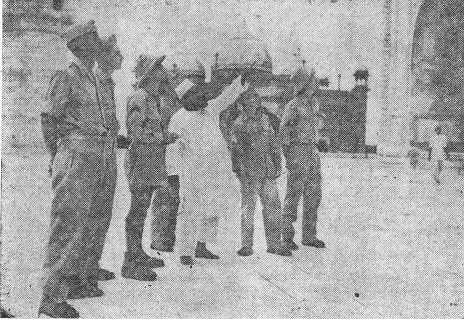 Recently the nine remaining Tokyoans were ordered to return home and here you see five of the lucky nine about to leave their advance Indian base by plane on the same day and only a few hours after receiving their orders. Reading from left to right, they are: M/Sgt. Fred A. Braemer, Seattle, Wash.; Capt. Richard A. Knoblock, Fort Sheridan, Ill.; Capt. Thadd H. Blanton, Gainsville, Tex. ; Lt. Carl R. Wildner, Amherst, Mass. ; and M/Sgt. Robert C. Bourgeois, New Orleans, La. The four not in the picture were: Capt. J. Roydon Stork; T/Sgt. Aden E. Jones, Pasadena, Calif.; T/Sgt. Robert J. Stephens, Hobart, Okla.; and S/Sgt. Bert M. Jordan, Covington, Okla.
All of these men remained behind while their fellow raiders returned to the States to tour the country in glory. They followed up their first bold blow with raids over China and Burma and each has been awarded the Air Medal to wear along with the Distinguished Flying Cross and Chinese Order of The Clouds, which they received for participating in the Tokyo raid. In addition, Knoblock, who served as operations officer for his squadron, and Wildner were recommended for the D.F.C. cluster for having over 200 combat hours and Stephens was awarded the Purple Heart for a wound he received in a flight over Burma. Besides strips of parachutes and shoes worn thin by tramping through China to safety, which were left behind as squadron souvenirs, these men have left the memory of a bold military mission carried out in the best Army Air Corps style. How to drive the Jap out of Burma is as obvious to us as why Venus de Milo never won the Olympic weight lifting championship or why Hitler has never been awarded the Nobel Peace Prize. Military strategists can scrap all their painstaking G-2 reports and use them for scratch paper to draw up the ultimatum for surrender. The answer to the Jap question is as simple as the multiplication table to Albert Einstein: - MATCHES. Not any matches, mind you . . . but Indian matches. After personally experiencing all the exquisite torture inflicted upon the human patience by the Indian match, we guarantee that, if heeded, our sage advice will win the campaign in Burma without the cost of a single man. Our plan is the essence of simplicity, Load transport planes with bundles of Indian matches and parachute them into Jap-held Burma along with the note, "To my boys, with love and kisses - Hirohito." Then go home and sip burra-pegs for a couple of weeks while these Satin-inspired instruments accomplish the job of shattering Jap morale. Judging them on their innocent outward appearance, our little back-stabbing adversaries would take them to be ordinary matches. He would grin his rabbit-toothed smirk. Then reach for an ersatz Nip ciggie. 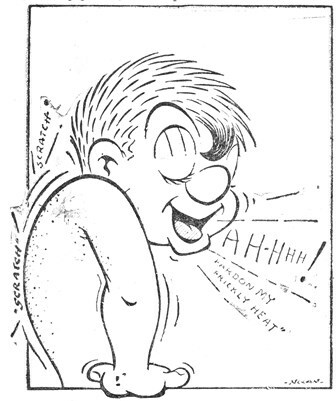 That, chum, is when he'll be neatly trapped, as surely as Melvin Purvis and the FBI trapped Dillinger. like a genie into his bottle after a hard day's work. It always does. But this faint flicker has encouraged him. Three more failures. Then another burst of flame. But the head has snapped off and singed off half of his left eyebrow and he's heartily cursing his 978 dishonorable ancestors. By this time, he feels as if the gauntlet has been thrown. The challenge dissuades him from chucking the box away, which he'd do if he had the sense the good Lawd gave the lowly jackass. Finally, with the box barren and himself knee-deep in broken matchstick corpses, the enemy is a quivering, screaming mass of protoplasm and, if he didn't commit hara-kiri on the spot, he'd run berserk into the jungle. In any event, a Jap Section Eight Board could rule on his case in as short a time as it takes Jesse Owens to cover five yards. Multiply this by the number of Japs in Burma and you have a faint idea of the lush field day a psychiatrist would have. 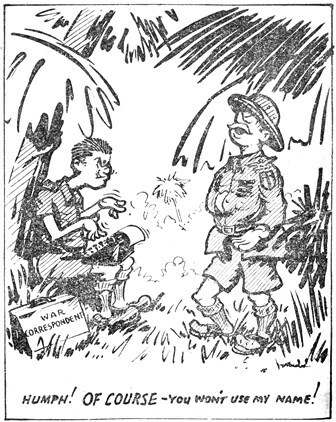 To complete the tactical plan and break the minds of those Nips still able to add two and two and lurch to their rice and saki when the dinner gong rings, Allied troops could walk through Burma insouciantly lighting cigarettes with American matches. Match this plan if you can, chum. Incidentally, we proved to ourselves last night that an Indian match could be lighted successfully under a fan. Oops, we'll have to finish this up now. Here comes the doc again. - By ANONYMOUS. 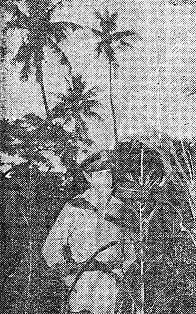 FARMER Colonel Cecil E. Combs, new boss of the India Air Task Force of Burma-blasting bombers, looks over the corn field which gives a homelike touch to the grounds around his residence. Hot roasting ears from this patch are currently a favorite item on the dinner table of the Texas-born Colonel. However, a boy armed with bow and arrow must be kept on constant watch for marauding monkeys from the surrounding palm trees, as the chimps have a real yen for corn. Why not appease them with a few copies of the Roundup, Colonel? Major General Claire L. Chennault told the press here that the Japanese have definitely reached a bottleneck in pilots. "We have received most reliable reports that the Japanese have circulated a nationwide appeal to young men to join their air force," the general said. "They are getting short-handed and desperately need new material - which is not available." General Chennault said that the Americans and Chinese recently shot down Zeros which had been out of the factory only a few weeks. He emphasized the high degree of cooperation with General MacArthur's Southwest Pacific command, and said: "The reason we have been striking so regularly at shipping around Indo-China is that the Japanese are attempting to withdraw men, munitions and supplies to the Southwest Pacific." General Chennault declined to comment on the recent Liberator raid on Paranushiru, but Colonel Eugene H. Beebe, commander of the Liberator force in China, said: "They ain't seen nothin' yet!" Skull and Wings squadron bombarded . . . by beer! 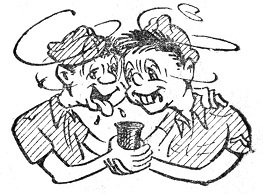 Continue reading, chum - it's not a desperate attempt for a Section Eight - this actually happened to local parched G.I. 's who for months have been sweating out a beer ration that did not come. And then, in the still of a peaceful Indian twilight, it happened. A plane flew overhead in a partial buzz job, the bomb bay doors flew open, and a moment later American canned beer was falling over a wide area in case lots. Astounded dogfaces could not believe their eyes . . . they'd been in India so long they were seeing things . . . but the proof was on the ground before them. With shouts of joy and feverish anticipation, they ran to the scene and began to grab for themselves undamaged cans and others from which maybe a swallow or two could be salvaged, muttering all the while, "Boy, oh boy! This is too good to be true . . . and Ruppert's, too!" It was at this point that disillusionment appeared in the form of two silver bars which arrived on the wild scene in time to direct disappointed salvagers to take the beer and deposit it in a nearby barracks. Well, you know G.I. 's - all started in that direction but... hell, they didn't have compasses and somehow ended up at wrong barracks . . . and it was too muddy to walk back . . . then also, it wasn't every day that beer arrived in a manner reminiscent of manna from heaven . . . in fact, it wasn't every day that beer arrived, So . . . . . Good, wasn't it chums? The first edition of Yank magazine to be printed in India rolled off the New Delhi presses on Tuesday. Printed on a better grade of paper than the original, the magazine is being distributed free throughout the command on a proportional basis. To state the number of men per copy would be to reveal strength. Each footstep jingled ankle-bells she wore. Nor did her sun-bronzed cheek betray a smile. And beauty one beholds in any face? For miners to pow-wow and gripe. Like food and baby doctor bills. Of strikers and their chief, John L.
Because they cannot have more pay. Is small to ask from fellow men. BUT WAIT UNTIL WE'VE WON THE WAR! In the old pig sty! - By H. R. N.
It is possible that there are those who feel a lieutenant general can do no wrong. Those harboring such pristine thoughts are invited to read on. 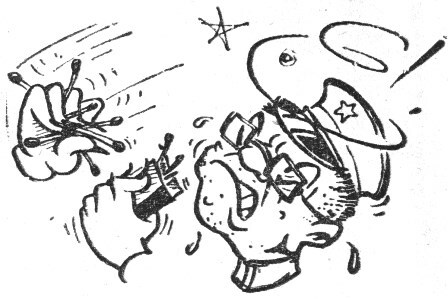 Lt. Gen. Joseph W. Stilwell has always been impatient with delay and forgetfulness. He has often raised unmitigated Hell with people traveling on his plane who have forgotten things that caused the ship to wait. Last week, while en route to Delhi, he spoke sharply to some unhappy soul for forgetting something, but just as the plane was about to take off the general remembered he had forgotten his bag. There was a delay of 30 minutes while Stilwell maintained an attitude of studied detachment and the remainder of the passengers sat back in smug complacency. Seventy-two more decorations have been awarded to members of the 10th Air Force, including six Purple Hearts, 28 Distinguished Flying Crosses, five Oak Leaf Clusters and 33 Air Medals. One of the most unusual awards of a flying decoration in this Theater was that of the Air Medal to Capt. Carey Leggett, of the Medical Corps, who has made more than 25 operational flights to study the physical and psychological stress upon the flying personnel of his organization under extremely diverse conditions. Lt. Owen P. Thorne received his Air Medal for outstanding heroism under fire in a battle over Burma between the bomber in which he served as lead bombardier and enemy fighters. During the action, a .50 caliber machine gun, suspended by a rubber cord, swung loose and struck Thorne on the right shoulder, dislocating it. With his right arm hanging useless, Thorne continued to jump from one nose gun to the other, firing on the enemy. His action played an important part in the safe return of his own as well as other aircraft in the formation. Lts. James H. Borden, Henry F. Cavanaugh, F/O Frank W. Majesky, S/Sgts. Bernard Barish, Dorse M. Fant, Sgt. Robert E. Truitt. Capt. John L. McLean, Lts. James R. Barton, Benson V. Carr, Joseph B. Coambs, Edward L. McCoy, Walter C. Steward, Jr., James R. Alexander, Jr., Lawrence F. Burge, Thomas K. Hanney, Max W. Hermann, John R. Miller, Ronald Ridgway, Arel Vanzandt, Roy A. Wentz, Jr.
T/Sgts. Robert W. Baird, Jr., Arthur J. Darling, Russell F. Doman. S/Sgts. Lester V. Bebout, Robert A. Carrier, Veri Frost, Horaace G. Gonzales, Thomas L. Grady, Chester L. Perigo, Lawrence D. Rademacher, George P. Sibulski, Robert M. Stantorf, Frederick V. Sunday, Ray A. Whistle. Lts. 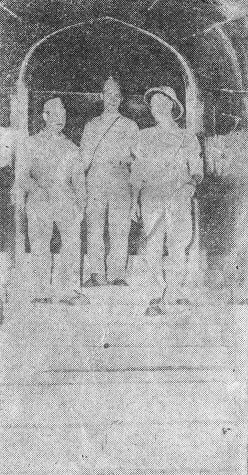 Frederick C. Bock, Robert E. Melton, Rafael Ramirez, S/Sgts. William D. Bogert, Ray Kenny. Capts. Carey Leggett, Wilbur H. Wittliff, Lts. Daniel Grinan II, Charles S. Huppman, Douglas M. Lowe, Ralph B. Speegle, Owen P. Thorne, John L. Sears, Robert L. Soper. M/Sgt. James J. Parkman, T/Sgts. 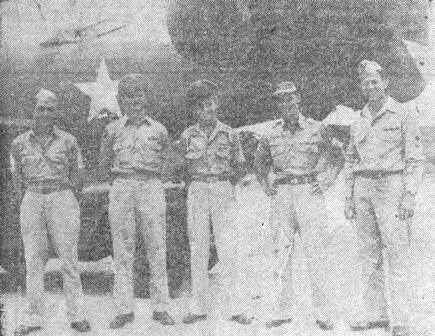 Robert A. Washburn, John W. Boyd, Walter C. Brown, Robert J. Stephens, Leon N. Weber, S/Sgts. George Atchley, Marvin I. Cargill, Eugene R. Drish, James S. Hendry, Jack E. Houston, Charles W. Kiesel, Kenneth A. 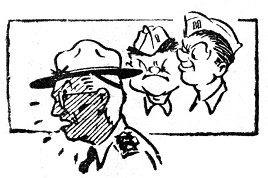 Marks, Don H. McCarty, John J. McMann, John B. Niquette, George M. Porvaznik, William M. Snapka, Sgts. Leonard M. Josephs, Meyer Nadler, Alfred Sullender, Cpls. Adriano Abiaza, Edward A. Gorney, Pvt. William A. Johnston. HQ., IATF - All it took was for Pvt. Joe Donnelly to remark, "But I thought during the monsoon it rained most of the time," and the unseasonable dry spell went floating off down the street. Mosquito boots, formerly for "evening wear," became uniform of the day, along with the raincoats and a variety of nondescript headgear, as the boys sloshed through the mud and dodged puddles or miniature torrents. All the long day the leaden skies drizzled, while long-faced troopers sat on the barracks porch. Said one, "Seems to be letting up a little," and I Pluvius, with an evil chuckle, kicked 'er up a notch and the patter became a pour. As usual, rifles and leather goods turned an attractive green, while the dhobi-walla, unable to get clothes dry even if he could wash them, simply hid out for the duration. In the mess hall, diners ate with an apprehensive eye on the growing damp spots in the ceiling and wondered who would get the first plateful of plaster. Yep, things were plenty monsoony, but, brother, it was cool. Came the long-sweated beer ration, and our leading bunk-huggers snapped to their feet with an action like a four-bit jack knife. Women and children were warned off the streets and fragile furniture stored in a place of safety; then the beer was put out. Pfc. Joe Rose and Pvt. Grady Ammons were the most successful of the many who furiously hustled the non-drinkers for their stocks, and by late evening these two still had about 5,000 feet altitude on all the rest of that malty crowd buzzing in the smoke-filled NCO club. In the two tubs of ice beside the bar, beer cans in gleaming rows acquired the essential chill, the piano tinkled fitfully above the voices, and suds (and other stuff) lay a foot deep on the floor. 'Twas a grand day. SEND IN STORIES Don't be bashful, chums. The Roundup isn't a closed corporation. If some interesting tid-bit happens in your neck of the C.B.I. Theater, sit down and write us a note: then run, don't walk, to your APO and mail us the details. All yarns, no matter how brief, are welcome. Humor, human-interest, the unusual, straight news releases - we have room for 'em all. ANOTHER CASE All overcharging is not confined to the Indian merchant or peddler. A certain staff officer turned his alarm clock into Cook & Kelvey, Delhi, for an estimate on cost of repair. The firm replied in writing that a charge of Rs. 15 would be made for correcting the alarm hammer, cleaning and adjusting the clock. The same job in the States, where wages would be 10 times higher and rent probably 50 percent greater, would have cost about $3. In any theater of operations the peripatetic war correspondents, like the poor, are always with us. Here we have our share. They are a strange breed in a way - neither fish nor fowl in the military establishment. Ours vary in types from scholarly Brooks Atkinson, former drama critic for the New York Times to boyish Walter Briggs, eager beaver for the United Press, in whose soul burns an unquenchable thirst to uplift the poor and the down-trodden. Under Army Regulations, the war correspondent is entitled to the privileges of an officer and has an honorary rank of second lieutenant conferred on him by the War Department. The scribe, although being officially entitled to such privileges, is often looked upon by officers as a minor irritant which requires the dispatch of the first sergeant for the Flit gun. The exception to this is when the correspondent is writing a yarn about the officer in question, in which case he is usually treated like a visiting general from the War Department and must listen to the story of the officer's life in 15,000 well-chosen words. Human nature runs true to form even in the Army! Although the correspondent may not be the soul of military decorum and may forget to say "sir" when talking to a newly-promoted first lieutenant, he is of intrinsic value to the military establishment. It is through him that the information of what goes on is passed along to the body politic which, in the last analysis, controls the officials, military leaders and bureaucrats who make life for us either a bowl of cherries or canned cod fish. The policy toward correspondents in this Theater is a liberal one. They are treated as friends of the court and Theater directives have ordered that subordinate commanders give them every cooperation and assistance. It is officially recognized that, though he is fundamentally a friend of the court, the correspondent is not a propagandist for individuals, organizations nor even the Army itself. His job is to report our military activities as honestly as military security permits. That is usually being done here by correspondents who do not spend all their time sitting about New Delhi or Chungking. One reporter has flown sufficient hours on bombing missions to entitle him to the Air Medal, were he eligible. Others have many times hiked deep into the jungle to get stories from outposts which sometimes seem to have been forgotten in the bigger picture of handling air forces and service troops. The correspondent should be treated as a member of the family and not as a step-child lacking a handkerchief.